Saturday 1st May. 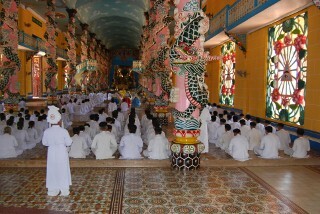 Vietnam week 3. Where is the time going? 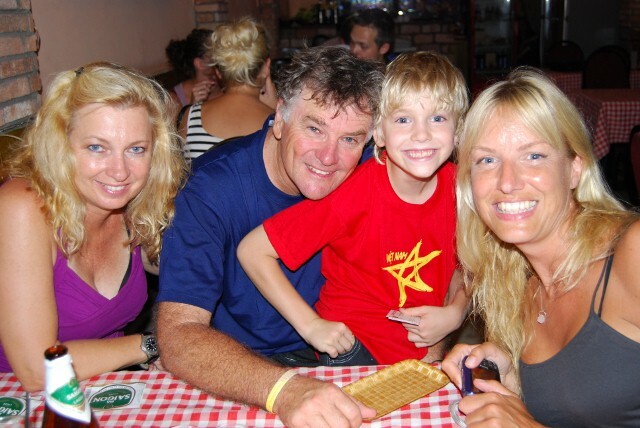 When we left you last month we were just about to leave Hoi An and head back to Saigon. We paid a guy to drive us back to Denang and to the airport for another Jetstar Asia flight arriving in Saigon just on dark. Almost being locals now, we grabbed a taxi and made our way back to our guest house. We were greeted like family members by the hotel staff, which was really nice. There is something comforting about being in a familiar environment when you are traveling, especially in a foreign country. Dinner and then off to bed. It had been a big day. Sunday 2nd. 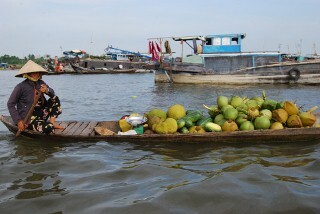 Our main job today was to arrange a trip to the Mekong Delta. We had looked up a few different tour companies on the net but we were a bit concerned about the big group thing, especially if we wanted to go for 3-4 days. The thought of being herded on and off buses and boats almost made us feel ill, but what choice did we have? Chris was keen to do it all ourselves, just take off in the general direction and make it up as we went along. I am sure it's possible, I'm sure it would be fun and it would be cheap but it would just be too hard with the kids. 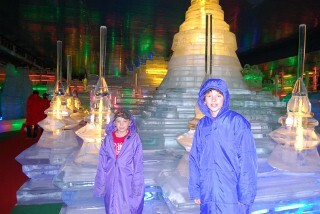 Traveling with children does add another dimension, and does make it a little more difficult. We went off the 'do it ourselves' idea and back to the tour idea. We visited a few tour companies around us that had been recommended. We ended up with a company called Delta Tours. 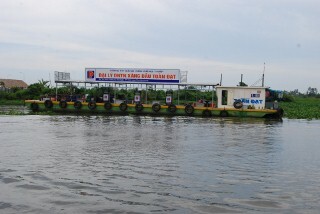 They would be one of the biggest in Saigon doing the Mekong Delta. We walked out of the office an hour later very pleased with ourselves. I think by luck we were served by the owner of the company. He explained all the options and after I voiced my concerns about being on a group tour he suggested something we could not say no to. They had just branched out into 'private tours' and as it turned out we were their first. What it meant was, we had our own guide for the full 3 days, our own large houseboat, our own cook, deckhand and skipper. Four staff and us. No one else to deal with, no dickheads (other than me) and control to do what we wanted. It was expensive at around $600-00 Aus compared to about $200-00 for a group tour, but money well spent. More of that later. Load em up, just one more box. 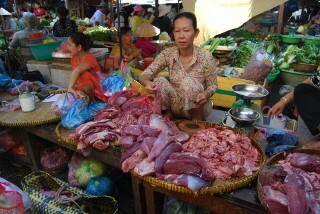 We then went and did a bit of shopping at the Chinatown Markets before catching a public bus back to District 1. That was an adventure as we had no idea where to get off. I then went and had an hour foot massage before heading off to see Brad, Tina and the kids again for dinner. Tina thought we needed a real Vietnamese experience so insisted that we jump on the back of their motor bike to get to the restaurant. Brad rode with Harry and me on the back, and off we went. Funnily enough it wasn't that bad once we were cruising along in the flow of the traffic. Brad then went back and picked up Alex and Chris. We must have looked a sight. We had yet another great meal and far too many beers and I was very glad to be catching a taxi home and not a motor bike. 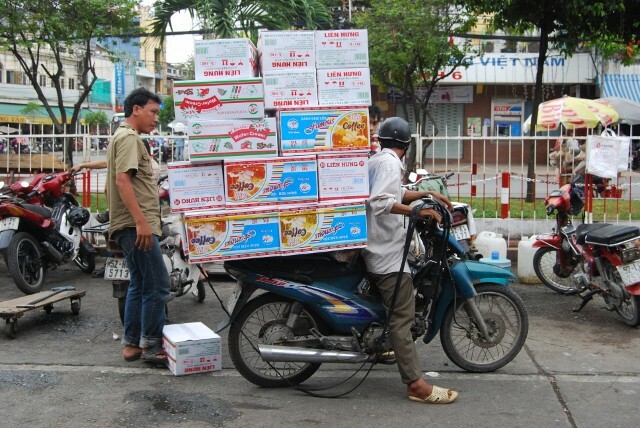 There is no drink driving rules in Vietnam, so if you can't walk, you ride. The kids again ran riot after dinner, with nobody seeming to give a damn. Our guest house locks up at midnight and if you come in later than that you have to wake them up to let you in. That happened to us the first time we went out with Brad and Tina and I was not going to let that happen again. I looked at the clock around 10-00pm and thought we had plenty of time. The next time I looked, it was after 11-30pm. Oh my god. I felt like Cinderella. I jumped up, ran around in circles and called a cab. We actually got back to the guest house with 10 minutes to spare. My heart sunk as I walked up to find the place 'locked up'. Luckily they were still up so they let us in and we sheepishly disappeared upstairs. Sit down and hang on: life on a Honda. Monday 3rd. 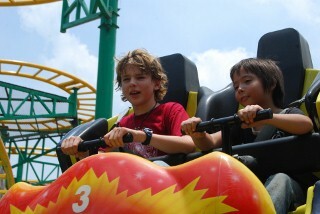 We had arranged to again see Brad, Tina and the kids and they were taking us to a large theme park called Dam Sen. There was a small entry price and then you had to pay for each ride, which cost just over a dollar a ride. 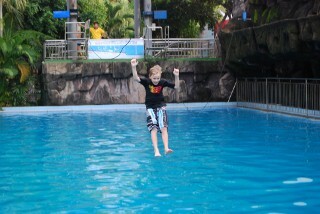 The kids had a ball (as did we) which was great as it was the first real kids day they had had since being in Vietnam. 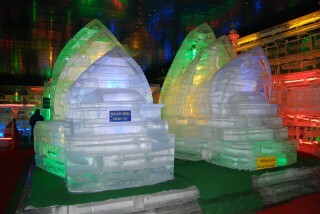 This park even had an ice sclupture display, complete with ice carvings of famous places in and around Vietnam as well as the Egyptian Sphinx and the Sydney Opera House. 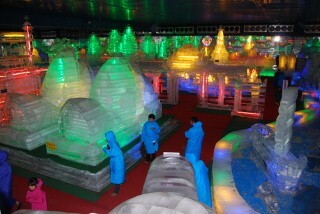 This place was really cool! (Ha - pardon the pun!) 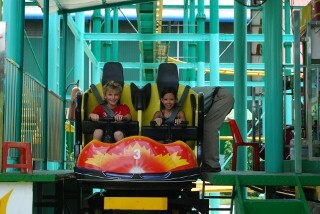 After lunch they were all 'ridden out' so we then headed to the water park that is in the same complex. This water park is enormous. 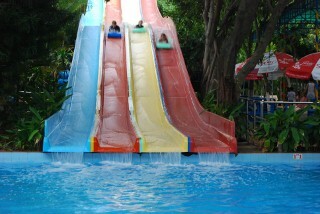 There were close to 20 big slides, wave pools, rivers, flying fox (over water which you fall into) and more. It was bloody amazing. 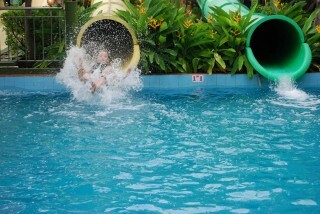 They ran and ran and slid and slid. By the time we were thrown out they were shattered. 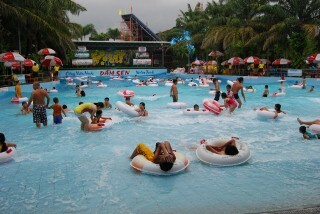 Dam Sen Theme Park: rides, ice sculptures and water park. 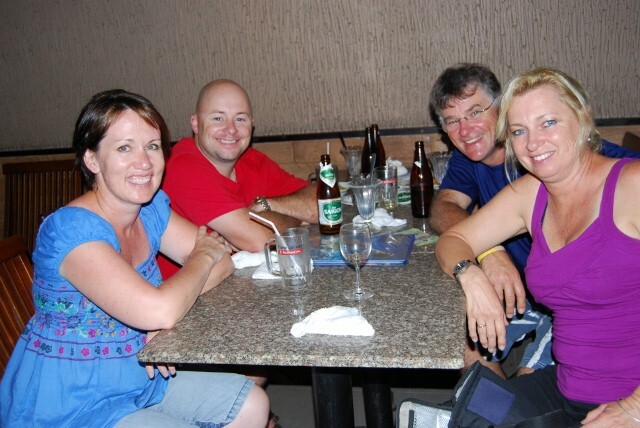 We planned to meet up with Shane and Sharlene who had just returned from the Mekong. We went out to a small Indian restaurant almost next door to our guesthouse. In fact we were so close that after dinner the boys went back to our room to do their journal and watch TV (I am sure there was more TV than writing) with Mr Tuan (the guesthouse owner) watching out for the boys. That's good service. We stayed in the restaurant (food was beautiful) and again had a few too many beers. Shane is a bad boy, fancy leading me astray like that!! 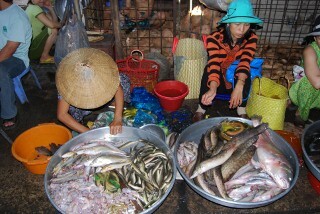 It was then back to our room at some horrible hour to pack for our trip to the Mekong at 8-00am the next morning. Why do we do this to ourselves? Isn't this meant to be a holiday? Tuesday 4th. Up at 6-00am, breakfast by 7-00 and at the tour company by 7-30am. This is the plan. We catch the bus with everybody else to Cai Be, arriving at 10-30am. It's pouring. From this stage we leave the cattle tour and are on our own. You bloody beauty! 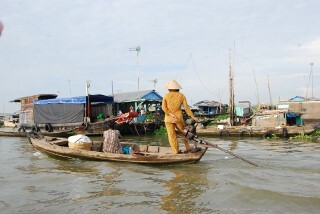 We boarded our own Sampan and headed off down the river. One boat with the four of us, being passed by a boat the same size with 15 people jammed on board. 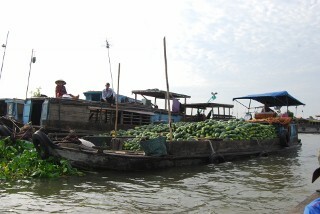 We have our first look at the floating markets. It's only a small market but was a good start. 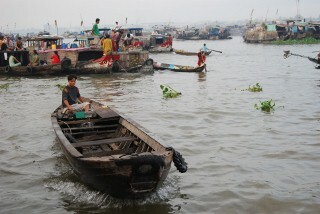 These boats collect their goods from elsewhere and arrive at the selling spot during the night or very early in the morning. They then stay there until all their gear is sold, which could take a number of days. You know what each boat is selling as they have a bamboo pole with whatever they are selling hanging off the top of the pole. Bananas, potatoes, pineapples and everything else you could imagine. We then went ashore and visited a few small factories. The first made rice paper, the second coconut candy (that was seriously nice) and then a place that made rice popcorn. They basically put rice in a huge wok and bugger me it pops and carries on like popcorn. They then make it into a bar that looks a bit like an LCM bar, only blander. 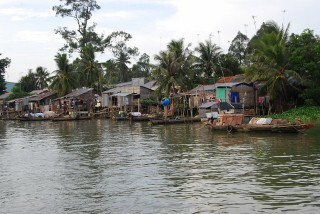 It was then back to the sampan and pottered down the Upper Mekong River. Next stop ashore was for lunch at a rather flash turnout. 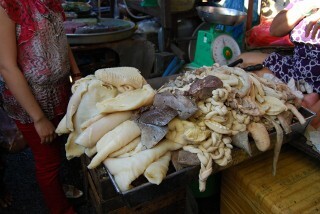 We had a traditional meal from this area called 'Elephant Fish'. It was baked whole complete with scales. It was rather ugly looking but didn't taste too bad. You picked off the flesh and then made your own spring rolls with a few other bits and pieces. Not the sort of thing you would want everyday, but now we have tried it we can cross that off the list of 'must do things' before you croak!!!! Then instead of getting back in our sampan we boarded two small wooden canoe-like boats with a lady standing at the back rowing. We were paddled down a small creek eventually meeting up with our sampan again where we were taken to our private houseboat. 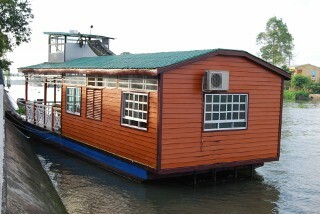 Now to the houseboat. This thing was big. It had a large bedroom at the rear that had a queen size bed and a double. Then there was a small galley and a bathroom. That took up about the rear third of the boat. The front 2/3 was all open living area, consisting of a large dining table and chairs, a cane lounge and an esky full of beer and soft drink, on ice of course. It was actually rather flash. So there we were, the four Parfitts and our four crew. 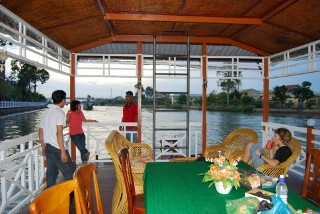 Our houseboat, 4 staff and us. 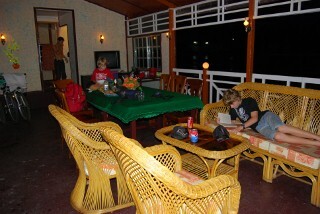 No sooner were our bags in the room and we up anchored to start on down the Mekong towards Sa Dec, arriving around 5-00pm. Now let me back track a minute. When we were booking this tour we stated we did not want to go to the mainstream touristy places, we wanted to see the places that tourists don't generally get to. So we arrive in Sa Dec and get off the boat and make our way to the local markets. Clearly not many Caucasians make it here as people were stopping and staring, giggling and grabbing at the boys. I asked Nuwate (our guide) if there were any restaurants around. She looked at me with a rather distressed look on her face and said, you wanted to go where no tourists are! No tourists = No Restaurants. (None that we would feel comfortable eating in anyway.) Oh bugger. We never thought of that. Plan 2 was to buy something at the market that our kitchen hand could knock up for us. We looked and looked and all we could find that we thought wouldn't give us vomiting for a week was bread, eggs (and they were questionable), tomatoes and two pineapples. This was going to be a flash meal!!! 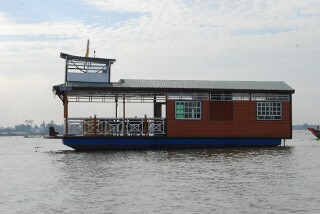 We jumped back on the boat, all had hot showers and then sat back in our big comfy lounge, beer and wine in hand as we continued to cruise further down the Mekong. This would have to be one of the highlights of the trip. To be on our own, to be so comfortable, to have so much diverse scenery all around us, to be sitting there having a drink while the kids sat at the table playing cards, was simply sensational. I wished that moment could have gone on forever. 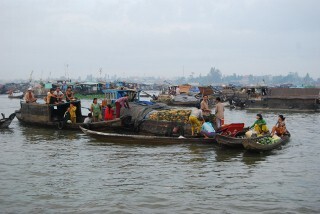 The plan was for us to continue down the river arriving at the Long Xuyen floating markets some time in the early hours of the morning. The beauty of this was that we did not have to waste time during the day moving from place to place, it all happened while we were asleep. Wednesday 5th. 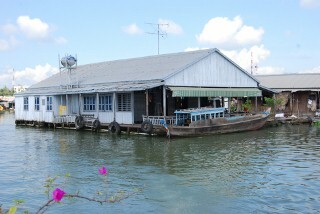 We woke very early to find ourselves anchored in the middle of a huge busy noisy floating market. There were boats everywhere, hundreds of them and we were totally surrounded. We had a very ordinary breakfast of instant noodles with a raw egg floating around. Believe me it was not very appetising. 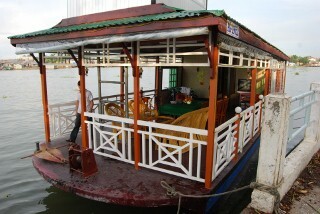 We were then collected by a small putt putt boat that took us for a cruise around the floating markets. This is quite an industry. 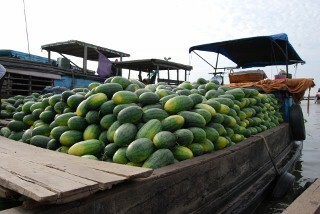 There are boats selling every fruit and vegetable you could imagine. Then there are boats servicing the needs of all the boats and those that sail upon them. There are breakfast boats, drink boats (the bar boat), grocery boats, floating workshops and even more floating fuel stations. If you need it, someone sells it. You really have to give it to them. 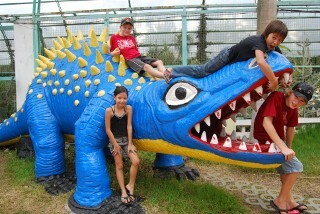 We were then taken to the shore where we jumped in a taxi and went to a crocodile farm. Having seen many, many big crocs over the past few years it was not that exciting so we didn't spend much time there. We chose to get a couple of cyclos back to the river, with Chris and me both squashed into one. The poor old bugger doing all the work was really struggling with us two on the back, gorking around. 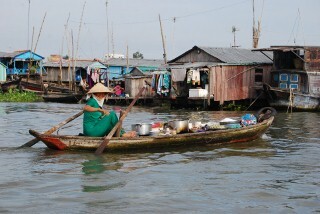 Harry falling off the bike; water-view housing, Vietnamese style. 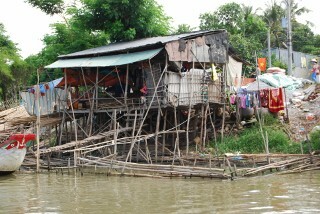 It was then back to our houseboat where we motored further down the river to our lunch spot. I am not sure if I mentioned earlier but our houseboat also came complete with mountain bikes that we could use whenever we liked. So out came the bikes and off we went. For all of us except Harry, the bikes were fine. Unfortunately even with the seat right down, the bike was far too big for him. 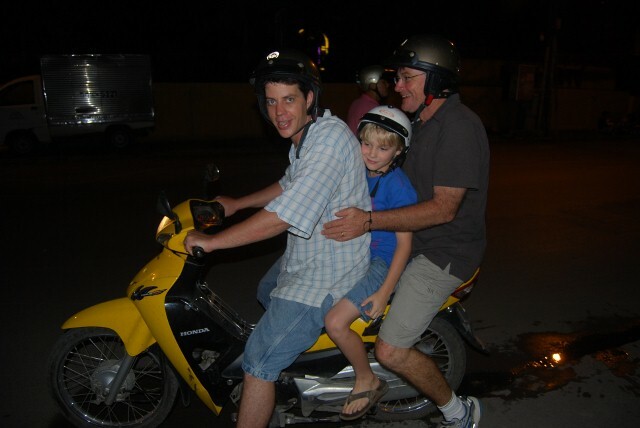 Our guide did offer to get a motor bike with driver to take Harry to the restaurant, but no, Harry insisted on riding. So off we went down very wet, dirt tracks complete with some huge puddles that we had to ride through. 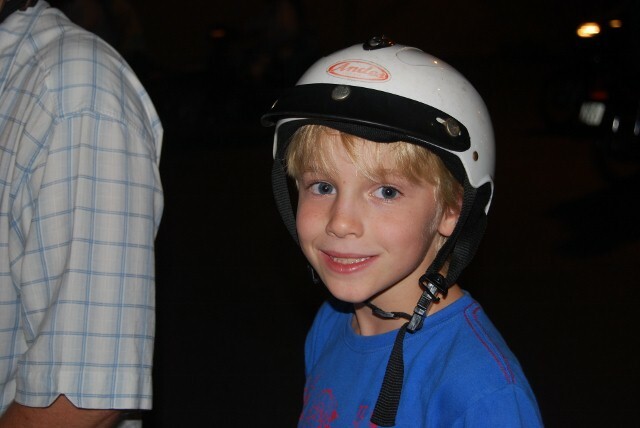 All went well and then we had to ride down a very busy road with cars, trucks, buses and bikes all tearing past, while Harry wobbled down the road, oblivious to the danger, and oblivious to me having a nervous breakdown, riding along behind him. After lunch it was back on the bikes, back down the busy road until thank goodness we made it back to the dirt track. No more danger. Now I can relax again. Harry tackles the first, longest and deepest puddle. Instead of riding around the edges, straight down the middle he goes. 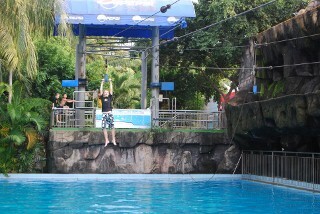 Half way through, splash! Harry has a huge stack and ends up spread eagled in the middle of the smelly wet mess. I was laughing so much I nearly fell victim myself. Back to our boat where Harry was hosed off and thrown in the shower. After four hours of cruising even further down the river we made our way to Chan Doc which was the end of our time on the houseboat. Tonight we were to spend the night, still on the water but now on a floating hotel. 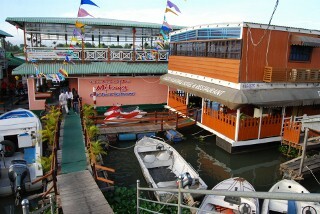 This was a big turnout with the floating hotel and huge floating restaurant. Our room was nice and large, with air conditioning and TV. We got our bags into our rooms and then headed off down town to check it out. 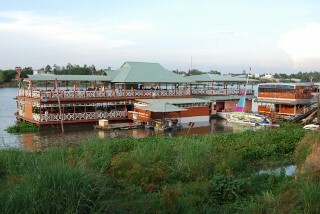 Markets and more markets but very little sign of western restaurants so it was back to our floating hotel for dinner. This floating hotel is owned by the same guy that sold us this private tour and it was very obvious that we were being treated like VIP's. I ordered a beer that was not cold, so I called the waitress back and explained I wanted a cold beer. There were people running around like headless chooks to get it right. The food was actually nice and the view magnificent. Thursday 6th. We were woken at some horrid hour with a bang on the door, and at breakfast by 6-30am. Our guide, Nuwate took us for a walk around town and back to the markets again. 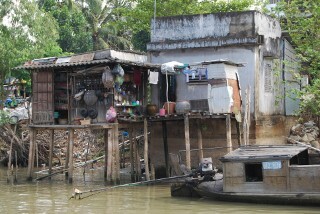 It was then back onto another boat where we visited the 'Cham Islamic Minority Group' Island. I am not exactly sure why we wanted to visit here, but visit we did. 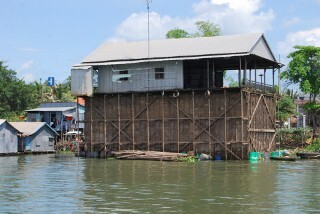 Back on the boat and across the river to a floating fish farm. This was extremely interesting. From the outside it looked exactly like a nice house in the middle of the river. 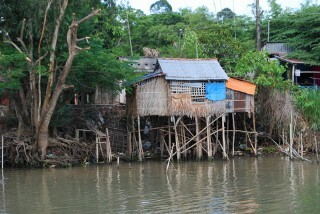 Below the house is a metal wall going 8 metres under the water. The house is 10 metres wide and 20 metres long, and the fish tank underneath is the same size, and holds 100,000 fish of various varieties. They are fed three times a day and use 6 bags of food at $30-00 each a bag. 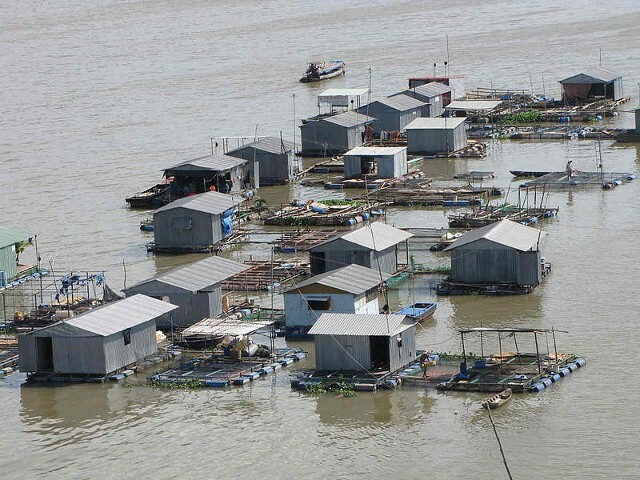 Yes, that is $180-00 a day and these fish take up to a year to reach saleable size. That is a lot of money. As these people are unable to afford that, they borrow money from the government and cross their fingers that they have a good season, no disease and a good market price, which is the reason they have many different varieties of fish all in together. 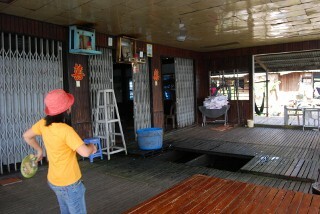 Fish farming: 1st small photo is a farm raised for cleaning. That is how deep they are in the water. They also cook up tons of feed using local products to supplement the feeding. 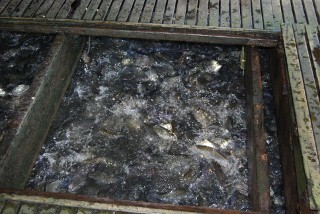 When they lifted up the floor and we threw in a handful of food the fish went crazy, with the splash actually wetting us. I would hate to think what would happen if you fell in, I reckon they would eat you alive. 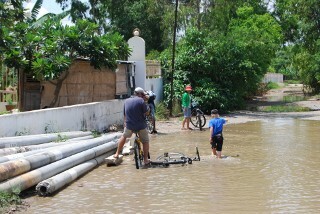 That was unfortunately the end of our trip up the Mekong. 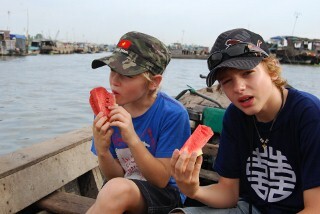 It was now back to the shore, on the bus and 6 hours back to Saigon. We had planned to meet up with Shane and Sharlene again for dinner, which was a bit sad as it was their last night, and more importantly, who would I have to drink with now? We again had a great fun night. Thanks for the laughs guys. Hope to catch up with you back in Oz. Friday 7th. A very lazy day today. A sleep-in, late breakfast and then a final walk around town. We were actually a little sad at the thought of going home the next day. A month is a long time to be living out of a backpack, but boy had it been fun. We did some last minute shopping and bought a few presents. 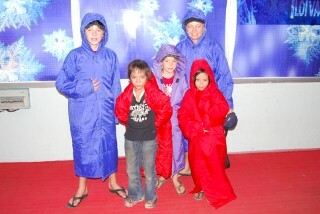 Late in the afternoon we met up with Katie who we had met on the overnight train from Hanoi to Hue. We had a walk around the streets at night which I really enjoy and then found yet another excellent restaurant for dinner. Saturday 8th. Our last day in Vietnam. Our flight back to Darwin was due to leave at 11-00pm. Now most people would fluff around and take it easy. Well not us. 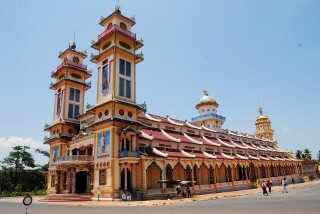 We booked ourselves onto a full day tour to visit the Cu Chi Tunnels and the Cao Dai temple where they practice the Cao Daism religion, which is the third largest religion in Vietnam. 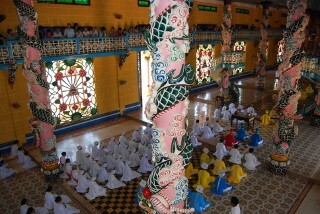 Cao Daism is a syncretistic religion which combines elements from many of the world's main religions, including Buddhism, Confucianism, Christianity, Hinduism, Islam, Judaism, Taoism, as well as Geniism, an indigenous religion of Vietnam. They currently have 7 to 8 million followers in Vietnam and about 30,000 members elsewhere, primarily in Asia, Australia, Canada, Europe and the United States. Pray at least once per day, at 6 am, noon, 6 pm, and/or midnight. Eat from a vegetarian diet at least ten days each month. 1/ Do not kill living beings. 2/ Do not be dishonest. 3/ Do not commit adultery. 4/ Do not get drunk. That all sounds fair and reasonable!! 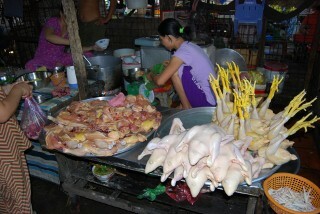 Next, lunch at a nice roadside cafe, then off to the Cu Chi Tunnels. These are both interesting and gruesome but a place we would like to have spent a bit more time at. Harry was very much over the whole war thing and basically shut off, for which I don't blame him. 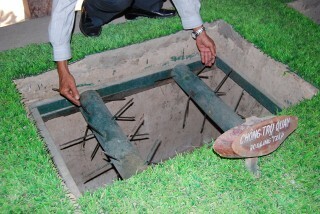 This area in Vietnam is very significant in this country's history. 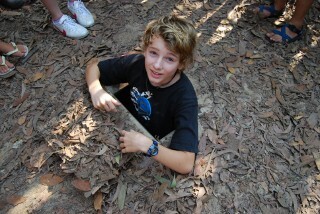 Many, many battles were fought and mostly won by the Viet Cong in this area. The labyrinth of tunnels snaked around the countryside for over 200 kilometres. 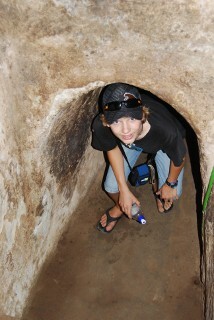 There are three levels of tunnels in some places and are only just wide and high enough for a small person to walk stooped over or crawling. It is bloody hot, unbelievably humid and to be perfectly honest rather unpleasant as you crawl your way along the few hundred metres of unsupported tunnels that is still open to the public. These sections have also been heightened and widened so tourists can fit - must have been awfully small beforehand! 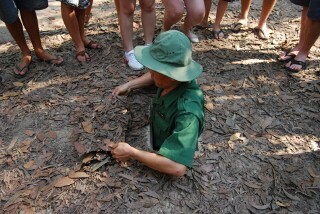 Cu Chi Tunnels- some very nasty things happened here. The tunnels were used by Viet Cong guerrillas as hiding spots during combat, as well as serving as communication and supply routes, hospitals, food and weapon caches and living quarters for numerous guerrilla fighters. Within the tunnels were firing posts, ammunition dumps, dormitories, kitchens, first aid stations and even bicycle powered generators, as well as sink holes for collecting fresh water. 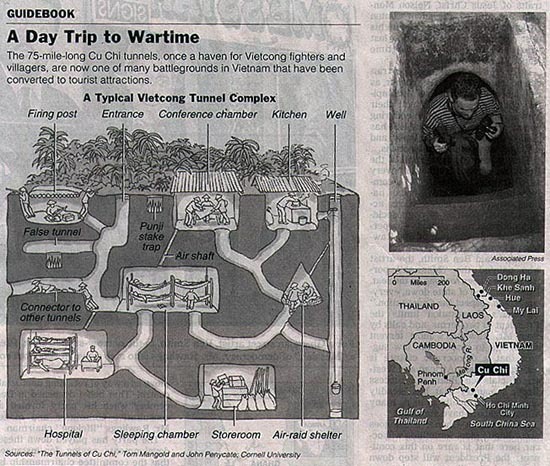 The role of the tunnel systems should not be underestimated in its importance to the Viet Cong in resisting American operations and protracting the war, eventually culminating in an American withdrawal. 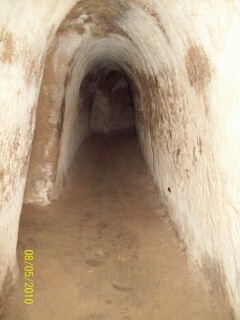 American soldiers used the term "Black Echo" to describe the conditions within the tunnels. 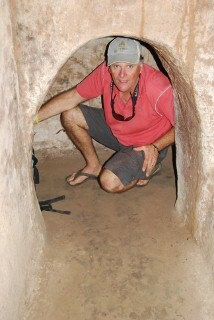 For the Viet Cong, life in the tunnels was difficult. 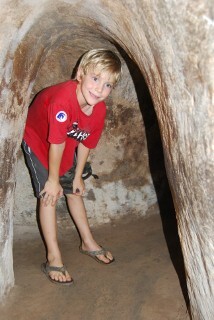 Air, food and water were scarce and the tunnels were infested with ants, poisonous centipedes, spiders and mosquitoes. Most of the time, guerrillas would spend the day in the tunnels working or resting and come out only at night to scavenge for supplies, tend their crops or engage the enemy in battle. Sometimes, during periods of heavy bombing or American troop movement, they would be forced to remain underground for many days at a time. Sickness was rampant among the people living in the tunnels, especially malaria, which accounted for the second largest cause of death next to battle wounds. A captured Viet Cong report suggests that at any given time half of a PLAF unit had malaria and that “one-hundred percent had intestinal parasites of significance”. 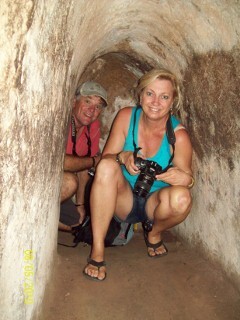 Inside the tunnels - hot, humid and most unpleasant. After being rushed through by the tour leader (God I hate these tours) it was back on the bus and back to our hotel. A quick shower, and then into a taxi for the final time this trip and off to the airport for our flight back to Australia. The horrid all night flight with Jetstar was actually really good (he must have been hallucinating - Ed), well, as good as it can be leaving at 11-00pm and arriving back in Darwin at 5-30am. We made our way through Customs and Immigration with ease after declaring everything. I honestly think it is easier to tick every box on the form and let them have a quick look through your bags. We had packed everything that needed to be looked at in one bag and that was the only bag they wanted to look at. I offered to open the others but they didn't seem interested. Shaun (who had been looking after our car) came to collect us and took us back to his place. They had set their camper trailer up under the carport for us to stay in for the few days we planned to spend in Darwin before heading back to Warmun for 6 weeks. We planned to go back to Warmun for a couple of reasons. The first was that we had left most of our gear in the house there while we went on holidays. That was just so much easier than packing everything up and then heading off on holidays. The other reason was that we really needed to get back to somewhere close so the boys could catch up on their school work, which was going to be difficult as they had about 9 weeks work to do in 4 weeks so it could be marked for the end of semester reporting. As we had not really slept at all on the flight home we tried to catch up on lost sleep during the day and while we were vaguely successful we still felt like crap. I have no idea what we then did for the next 3 days in Darwin but we seemed busy. So the 6 week holiday was over. We packed the camper again and made it as far Victoria River for our first night and then into Kununurra to do shopping before heading back to Warmun, arriving there on Thursday afternoon. I must say it was nice to get back, nice to be back in familiar surroundings, and the boys were happy to be back with their Lego and a few toys. We all had a great trip. No hassles, no dramas. The boys had as per usual been excellent and an absolute pleasure to travel with. We all learnt a lot, saw a lot and had a holiday we will remember for a long time. Now let me give you a few tips should you plan a trip to Vietnam. First let me repeat what I said last month. This is a country on the move. If you want to see it before it 'takes off', get there sooner rather than later. It is a very cheap holiday. For the four of us, including all flights, tours, accommodation, meals and a whole extra suitcase of souvenirs cost us about $6,500-00 for the month. You should pay no more than $20-$30 US per night for a hotel room. (Most of the time we paid this for a family room.) There are literally thousands of really good hotels to choose from. In Saigon we used Ngoc Thao Guesthouse in District 1. On Hostelworld it rates about 95% for customer satisfaction. We would give it 100%. Just make sure you ask for a room with a window and balcony as they do have one room with no window at all!! Taxi's. 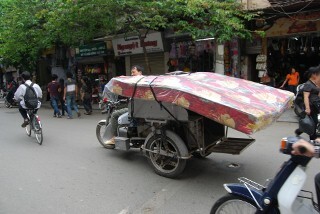 There are some very dodgy taxi operators throughout Vietnam. Use the right companies and they are as cheap as. Use the wrong taxi company and it could cost you a fortune. 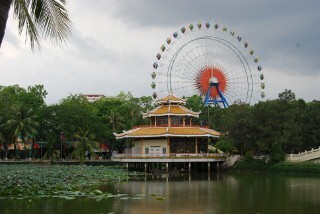 In Saigon use VinaSun (phone 38 27 27 27) or Mailinh GroupTaxis (phone 38 38 38 38). In Hanoi use Hanoi Tourist taxi (phone 38 56 56 56) or Mailinh Group. For all other areas use Mailinh Group taxis. They are everywhere. Be really careful that the phone number on the taxis is exactly the same as I have given above as there are tons of copy cat operators who should not be used, some with the same or very similar names. I would suggest booking at least one night's accommodation prior to arriving in a new town or city. We found 'Hostel World' on the internet to be great and always check out the customers comments or use other travelers word of mouth recommendations. Check out about free airport pickups. These are worth getting if you can. Otherwise all hotels can arrange to pick you up. It generally costs about $20-00US which is usually about double what a taxi would cost. Until we felt comfortable about getting our own cabs we did use this service, especially when we were arriving late at night. They take you right to your door and help you inside with you bags. We thought it was money well spent. With regards to what money to take, I still think a few thousand in Travelers Cheques is good insurance but would always use an ATM card to pay for things and for withdrawing cash. We found plenty of ANZ and a few Commonwealth machines that let you withdraw $5 million Dong at a time, which is plenty for quite a few days. Make sure you use your pin, not signing. We had absolutely no trouble with the ATM's the entire trip. If you plan to arrange your own taxi from the airport to your accommodation it would pay to take a few million Dong with you. The local Vietnamese bank ATM's only allowed $2 million Dong withdrawal which worked out more expensive in fees. Internal air travel is very reasonable. 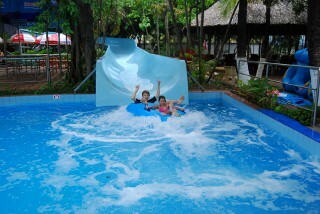 We used Jetstar Asia and found them cheaper than Vietnam Airlines. Just book and pay online. If using the hotel computers make sure you use Mozilla and not Internet Explorer to book tickets. I am not sure why but you generally are unable to book using Explorer. On the subject of computers, every hotel has them free in the foyer and some even have them in your room. I wish we had bought a really small laptop ('Notebook' only about $600-00) as again all the hotels have free wireless service available. It would have been much more convenient than lining up to use one of the crappy ones in the foyer. You then also have the ability to download photos, send emails and research your next destination without someone waiting behind you. For us this will be a must on our next trip. 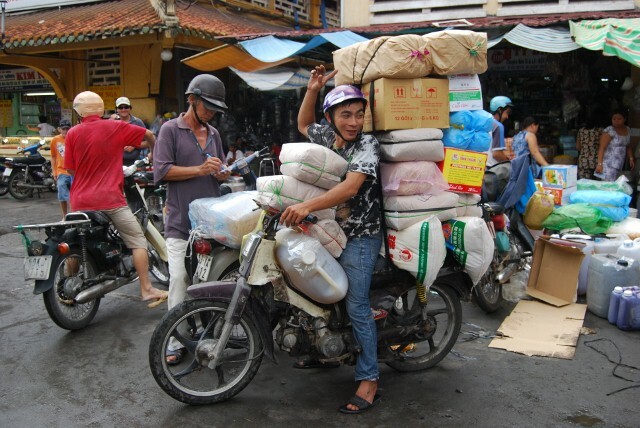 Tipping is not expected and not part of the Vietnamese culture. Unfortunately an increased number of American tourists who seem to tip everything and anything are starting to change this. 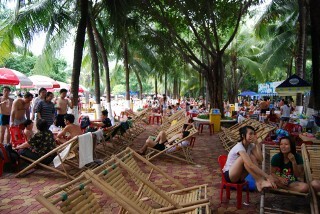 You will find the Vietnamese to be very friendly, very happy and very interested in 'white fellas'. The street sellers can be a bit painful but a 'no thank you' said with a smile and they are gone. We had no grief at all. Most shops and stalls expect you to barter. You will generally pay half or less of the original price offered. Some shops are fixed price and won't budge. Don't worry, you will find a thousand places selling exactly the same stuff, that do barter. It is difficult to buys men's clothes that fit. I am not very big and generally buy medium to large in Australia. In Vietnam I needed to buy XXXL or bigger to fit, and they were hard to find. Chris went to buy some pj's and the lady looked her up and down and laughed, 'Nothing, you too big'. That went down well. I suggest you take most of the clothes you need and don't rely on buying them there. 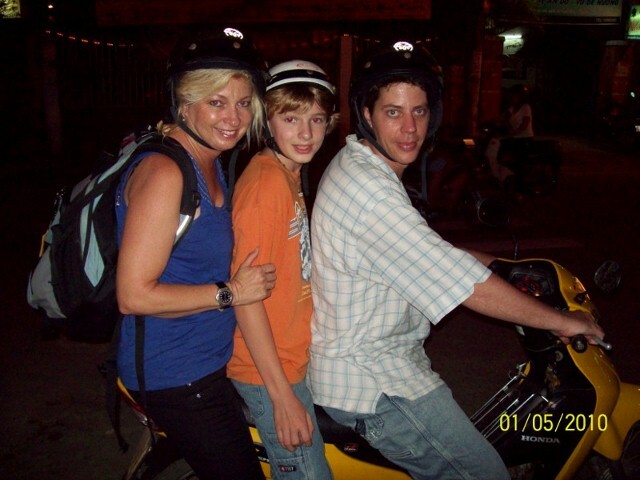 Kids are OK.
Hope that helps if you are considering a trip to Vietnam. We always felt safe even walking around late at night. This place never stops, never sleeps. We would highly recommend this as a great family holiday destination, but not a holiday if you want to laze about and do nothing. This is a get out there, see, learn and explore type holiday. 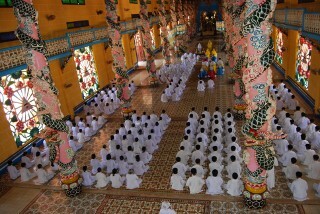 Next year we are looking at doing Laos, Cambodia and a bit more in Vietnam. We will see what happens. That's it for May for the Parfitts. June will be another busy one. We will be off to Kununurra for the weekend to see John Farnham at the Kimberley Moon Festival, and then we will be packing up (again!!!!) and heading to Broome for just on a week before heading up to Cape Leveque and One Arm Point for just under two months. We are really looking forward to getting back there as this is a very pretty part of this country, and what a great time of the year to visit it. 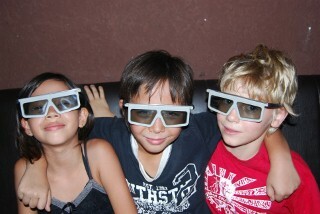 Travel, for children is part of their education, for the elder it is part of their experience.